The 1989 Ironman® World Championship was the greatest race ever. In a spectacular duel that become known as the Iron War, the world's two strongest athletes raced side by side at world-record pace for a grueling 139 miles. Driven by one of the fiercest rivalries in triathlon, Dave Scott and Mark Allen raced shoulder to shoulder through the Ironman 2.4-mile swim, 112-mile bike race, and 26.2-mile marathon. After 8 punishing hours, both men would demolish the previous record - and cross the finish line just 58 seconds apart. The race would redefine the limits of human endurance and the role of mental toughness in sports. In his new book Iron War, sports journalist Matt Fitzgerald writes a riveting epic about how Allen and Scott drove themselves and each other through the most awe-inspiring race in sports history. Iron War goes beyond the pulse-pounding race story to offer a fascinating exploration of the lives of the world's two toughest men and their unquenchable desire to succeed. Matt Fitzgerald is a sports journalist and best-selling author of 17 books including Racing Weight and Brain Training for Runners. He has written extensively for Outside, Men's Journal, Men's Health, Triathlete, Runner's World, Bicycling, Competitor, and countless other sports and fitness publications. Learn more about Matt at www.mattfitzgerald.org. 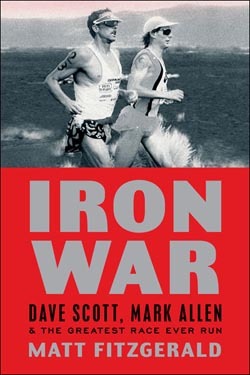 To sell Iron War in your triathlon or running store, please email, wholesale@competitorgroup.com.